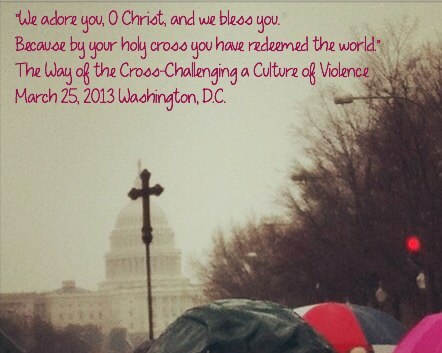 This morning joined several hundred Episcopal brothers and sisters to walk “The Way of the Cross” in downtown D.C. The walk was initiated by the Episcopal Diocese of Connecticut and was titled: “Challenging a Culture of Violence”. This walk from The White House to The Capitol was just one way to respond to the murders at Sandy Hook ES and the prevalent culture of gun violence in the US. We joined together, over 20 bishops, dozens of clergy and lay persons, young and old, gay and straight, all colors and many diocese to pray the stations of the cross . As we enter this holiest of weeks for many Christian traditions, this was our moment to publicly proclaim our hopes for peace and justice and to do so in a place of great political power. The liturgy was designed specifically for this event and each station featured a theme, a hope, readings, prayers, and a meditation. 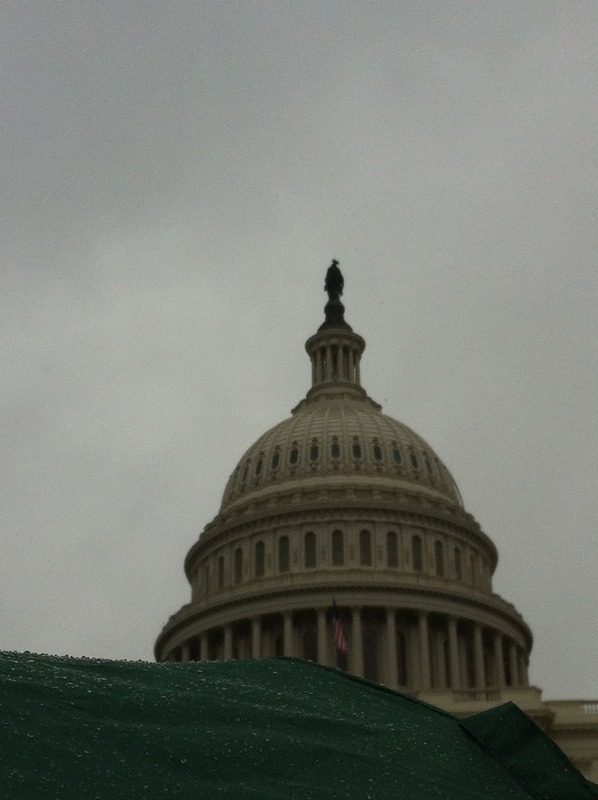 We battled the slushy snow, the cold rain, and the gloomy skies to lift up our petitions to the Lord. After renewing our baptismal covenant, we proceeded through town; stopping along the way to reflect on our themes and hopes. In Lafayette Park and the White House, we prayed that we would have the wisdom and courage to witness and build reconciliation in our land, affirming the dignity of all people. Along our way we repented of our own blindness to injustice, our judgements, and our prejudice. We turned our hearts and attention to remember that violence is not a local or national problem, but a global one and prayed for victims and peace. We gave thanks for those who picked up the cross in our own time to battle division, suffering, and injustice. We turned to our neighbors and sought out prayer for ourselves, sinners in His sight, that we might turn from our own exclusions and cultural attitudes towards love and peace. We decreed in the words of Abraham Lincoln, “then, thenceforth, and forever free” to accept the call to leadership in challenging our culture. We mourned the lives of those lost to violence, the suffering of their families, and call upon ourselves to be their advocates. We specifically named those lost in the shooting at Sandy Hook-the teachers, the children, and the shooter, that they may be held in the loving arms of Jesus. We prayed for the dignity of all people, created in the image of God. We prayed and shared peace. We prayed for our proper use and care of creation-that we do not reap violence upon the natural world. As we took our walk to the Capitol, in the shadow of the statue of Freedom, we prayed for our leaders that they may follow the way of St. Francis and sow peace, love, pardon, union, faith, hope, light, and joy in a world so desperate for it. We did all these things in the name of the Jesus Christ, in public, in front of tourists and businessmen, locals and visitors, police and the homeless. All to try to bring light to the dark culture of violence that plagues our country. The meditations that were recited at each station could each warrant their own blog post, they are so rich with wisdom and beauty. I am struck by the great thoughtfulness found in these church leaders as they bring words to help us understand our pain and our brokenness. Not once did we speak of weapons bans or background checks, though many of these bishops (and I) publicly support both. Rather we focused on the messages of love, reconciliation, justice, and peace. We turned inward to our own hearts–to search them fully and repent of our own hatred or ability to hurt. For it is in changing ourselves that we can truly begin to change the world. I did not know what to expect on this cold day. When I arrived I saw a lot of purple and black cassocks and not a single person I knew. I saw a few of the female leaders of our church whom I hold in great reverence (pun intended…) and a great number of young women clergy, which always gives me great joy and hope. I was struck by the dedication of the people-strangers and friends walking in the snow and rain for blocks and blocks. The hearts turned towards love. The great miles traveled by the congregants of Connecticut, New Jersey, and so forth to take this holy Monday to put their pain into action. This is why I love the “church” and biased-ly love my Episcopal church. I love that we can come together as strangers, around a common liturgy, and sow love into the world. We did not solve the problem of violence today. We did not walk into the violence directly and take action. But we did what we knew we could on this day-we prayed. We prayed in love and out loud, not to draw attention to ourselves (which I’m sure we did when stopping traffic on Pennsylvania Avenue…) but to draw attention to the cause. If we turned one heart today to challenge the violent culture in America, then we have succeeded. Pray for us, dear reader. Pray that our hearts may be so filled with love that we will strive to challenge and tackle the problems that lead to violence in our nation and world. Pray for those who mourn, pray for those who hurt, and pray for those whose hearts are turned toward hate. Pray for the lost and pray for the perpetrators. Pray for those who are courageous enough to take up the cross and pray for those that live in fear. If you do not pray-spread love in your own way-building empathy, justice, and peace in your world. May this Holy Week bring you peace and may the message of Easter ring true every day. Proud of you, what a very cool thing to do today.